The Bay Harbor Foundation is hosting a farm-to-table Community Dinner, which will take place on Main Street in Bay Harbor on August 30th, 2018. In 2009, the Foundation created a record with a World Record for the World’s Largest Parade of Electric Vehicles. We are once again working to create a new record for the Longest Five Course Farm-to-Table Community Dinner. 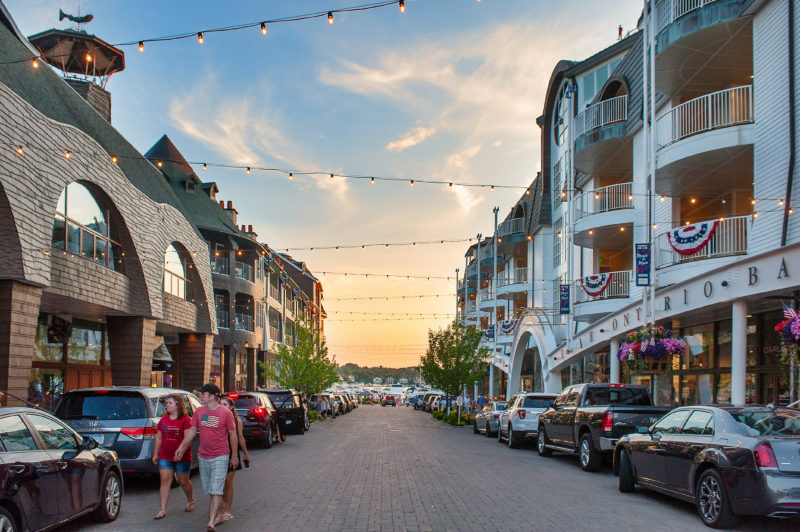 Guests will enjoy a candlelit dinner on linen-covered tables decorated with sunflowers that will be placed on 300 feet of Main Street in the Village at Bay Harbor. Guests will be served a delicious farm-to-table five-course dinner, plus a welcome tasting. This meal will showcase meats and vegetable sources from local farms, and a chef introduction will accompany each course. All of our Bay Harbor restaurants and chefs will be contributing to this event, along with many of our local wineries. We welcome guests from throughout the Little Traverse Bay Region to join in this World Record attempt in support the immediate health and human service needs in our community, and at the same time have fun with this win/win event. Help the Bay Harbor Foundation break a world record! locally grown food from area farms and businesses. serving local children in need. Sign up early for best seating! For more information go to the Bay Harbor Foundation website. Anne and Brian Bates dream of a sustainable future, where the arts, education, and organically grown food enrich their community. Bear Creek Organic Farm is Petoskey, Michigan's first-ever 100% USDA Certified Organic Farm. They were named 2017 Entrepreneur of the Year by the Petoskey Regional Chamber of Commerce and are located at 4012 Atkins Road, Petoskey. The McMaster family has operated what is now Bill’s Farm Market for over 100 years. Over 20 varieties of flowers, 10 kinds of herbs, and a variety of vegetables are continually rotated through 29 fields. The farm is famous for their peaches-and-cream sweet corn and is located at 4450 East Mitchell Road, Petoskey. Bolt’s Farm Market is located between Ellsworth and Atwood. Russ Bolt, who has been farming his 200 acres since 1985, offers fresh seasonal produce and flowers, as well as home-raised beef cattle. His products may be found in local stores, as well as at their roadside market, which is located at 9339 Atwood Road, Ellsworth. Initially established as a homestead under President Grant in 1874, Coveyou Scenic Farm Market has transitioned from dairy and livestock to their current production of organic produce. Owner David Coveyou is proud to use geothermal and solar energy to reduce their environmental impact. The farm offers local artisan creations, specialty foods, flowers, and soil, and is located at 4160 US 131 South, Petoskey. Greg Carpenter, artisanal baker and founder of Crooked Tree Breadworks, has a commitment to using only first-rate ingredients and to eliminate shortcuts for flavor that comes naturally. His traditional and time-intensive approach has earned him recognition from Bread Baker’s Guild of America and Traverse magazine. The bakery is located at Clock Tower Plaza, 2264 M-119, Suite #5, Petoskey. Famous for donuts, coffee cakes, bread, bagels, cakes, and cookies, everything is baked fresh daily at Johan’s Bakery. The bakery’s primary location is 565 W Mitchell St., Petoskey but also has locations in Harbor Springs, Charlevoix, Walloon, Burger Express, and Johan's Bagel on M-119. Originally a 40-acre fallow hay field near Cross Village, Open Sky Farm became certified organic in 2015. The owners enjoy growing unusual and great-tasting varieties, and they believe that the best quality produce is the result of good soil. The farm offers a variety of CSA options and is located at 5200 Zmikly Road, Pellston. Andrea and Ryan Romeyn have owned and operated the Providence Organic Farm since 1996. Their family is passionate about living soil, thriving plants, and healthy people. The farm offers organic produce, pastured meats, recipes, and CSA shares and is located at 5691 North M-88, Central Lake. Nestled alongside west shore of Walloon Lake, Spirit of Walloon Market Garden offers sustainably-produced vegetables, cut flowers, strawberries, and herbs. Farm Manager Rachel Cross has a degree in horticulture and strives to create farm systems that prioritize community health and crop diversity. The farm is located at 06255 Zenith Heights Road, Boyne City.